We started our first trading company in 1969. From that time to the present our enjoyment of turquoise has never ended. Our cabochons are cut from some of the finest natural turquoise available anywhere. It is also one of the better selections of turquoise to be found. The cabochons are well cut using only natural high grade to gem grade turquoise and in many cases are backed for protection. We hope you will enjoy looking at these wonderful turquoise cabochons with their beautiful colors and matrix. 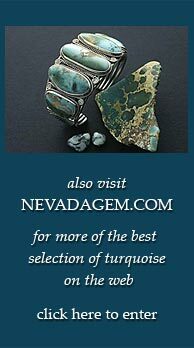 Turquoise truly is the 'Jewel of the Southwest'. We only offer Native American and contemporary jewelry made from the finest artists. To find this quality of jewelry we go directly to Indian Market in Santa Fe along with other major Southwest Native American artists fairs. We buy right from the artists at the fairs and in their homes. You’ll find that most of our items are made by award winning jewelers. The Nevada Blue mine is one of Nevada's great classic turquoise mines. It's location near the crest of the Shoshone range in Lander County made access to the mine, as well as the actual mining itself, extremely difficult. Today very little true high-grade Nevada Blue is available. The natural high-grade cabochons being offered here are from the last great collection of Nevada Blue and were purchased directly from the mine owner in the 1970s.